The Lightglo-BR Variable Intensity LED illuminator for Brunson Instruments fits the 2022, 2024, and 2062 telescopes, and replaces the tungsten light source completely. 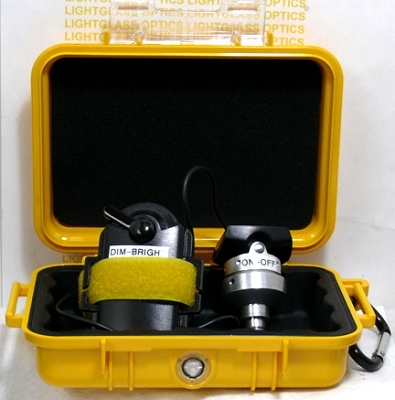 This illuminator also fits K&E and Cubic Precision Telescopes 71-2022, 71-2024, and 71-2062. This unit is entirely powered by 3 AA batteries, and will give 20 hours of illumination at half power. Variable intesity controlled by the lever on the battery pack, with illumination from 40 lumens to over 140 lumens at full intensity- more than 5 times the original illumintor, yet producing less than 10% of the heat of the original! The LED element is rated at 30,000 hours, so this will be a reliable source of light for....well- forever if you use your telescope 5 hours a week or so. Keep a spare set of batteries or even use rechargeables.